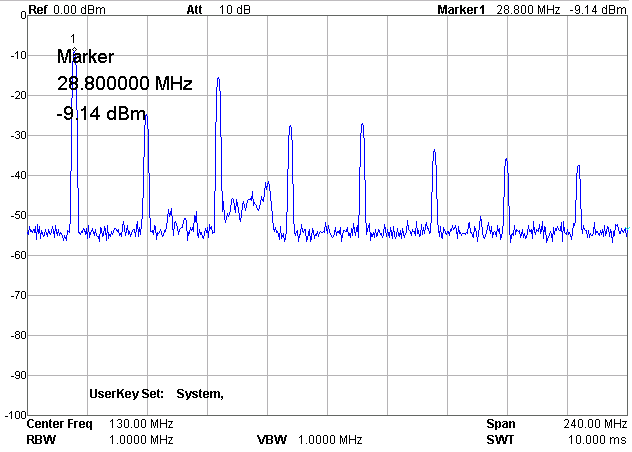 Sometimes, it is necessary to use 10 MHz as a reference frequency, e.g. from a GPS receiver. 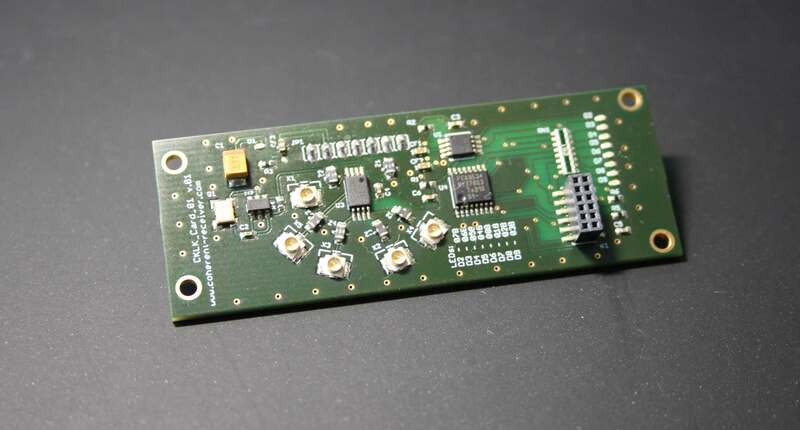 In this case, we propose the usage of a specially modified clock card (CLK_CARD10) that has been adapted to support the external reference frequency 10 MHz. In this card, the TCXO 28.8 MHz is replaced by the I2C Configurable Clock Generator (see figure above). 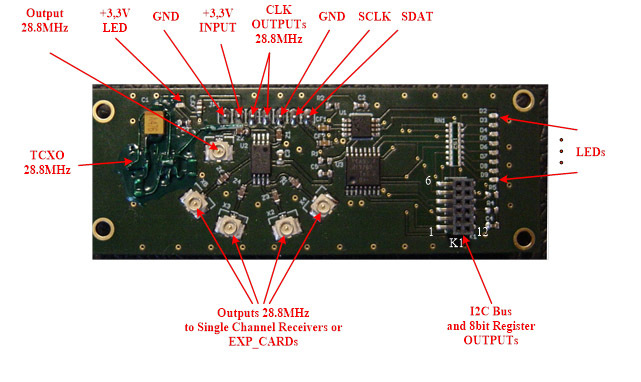 The CLK_CARD10 can be used in all models of the coherent receivers. 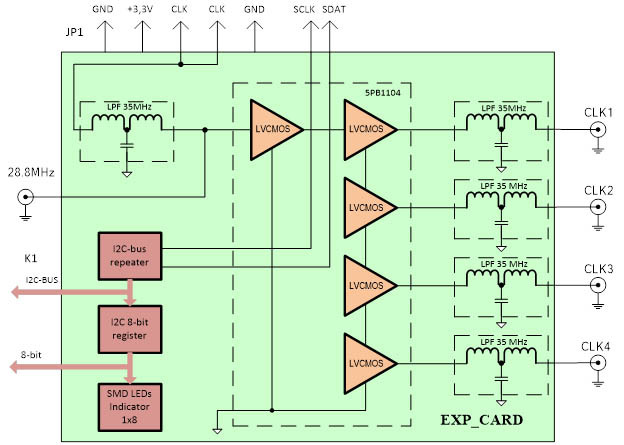 The ESP32 Clock Card 10 is a jitter-attenuating precision clock multiplier for applications, requiring sub 1ps jitter performance and under 0.2 ppm frequency stability. This card supports one clock input ranging from 0.1 MHz to 100 MHz and 8 non inverted and 2 inverted clock output ranging from 0.1 MHz to 100 MHz (higher frequencies possible on request).The input clock frequency and clock multiplication ratio are programmable through an I2C (ESP32-PICO-D4 USB2.0 ) interface. The clock card can be operated either from an internal TCXO or an external generator, e.g. 10 MHz from GPS receiver and is ideal for providing clock multiplication and jitter attenuation in high performance timing applications, e.g. for ADALM PLUTO SDR arrays. The card has integrated additional inputs/outputs (ESP32 peripherals) which can be controlled via WiFi or USB. These could be used, for example, for the control of mobile antenna systems, antenna switches or managing of spatial distributed arrays for MIMO applications. Default: 2 PPM initial offset, 0.5-1 PPM temperature drift. Optional: higher precision (0.1/0.5/1.0 ppm) is available on request. TCXO usually has an output resistance of about 10K , which does not allow direct connection of the TCXO to the Clock Buffer input. The Buffer Gate is necessary in order to match the high output impedance of TCXO and low 50 Om input impedance of the Clock Buffer 5PB1104. The simplest solution is to use Dual Schmitt-Trigger Inverter SN74LVC2G14. 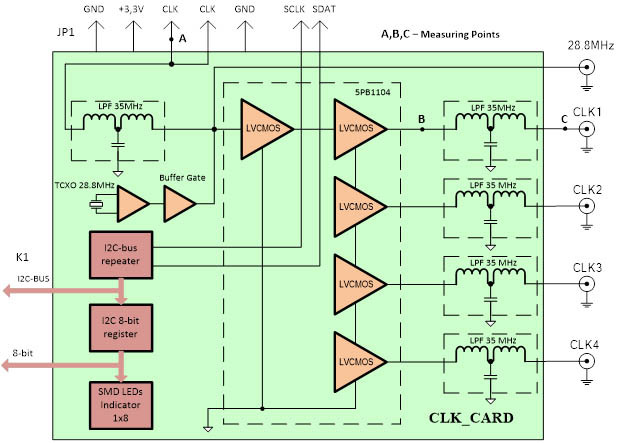 “The SN74LVC2G14 device is a high drive CMOS device that can be used for a multitude of buffer type functions where the input is slow or noisy. The device can produce 24 mA of drive current at 3.3 V, making it ideal for driving multiple outputs and good for high-speed applications up to 100 MHz” [Source: Datasheet]. The inverters are connected parallel in order to increase the output power. The clock card is based on the high-performance LVCMOS Clock Buffer 5PB1104 produced by Integrated Devices Technology, Inc. 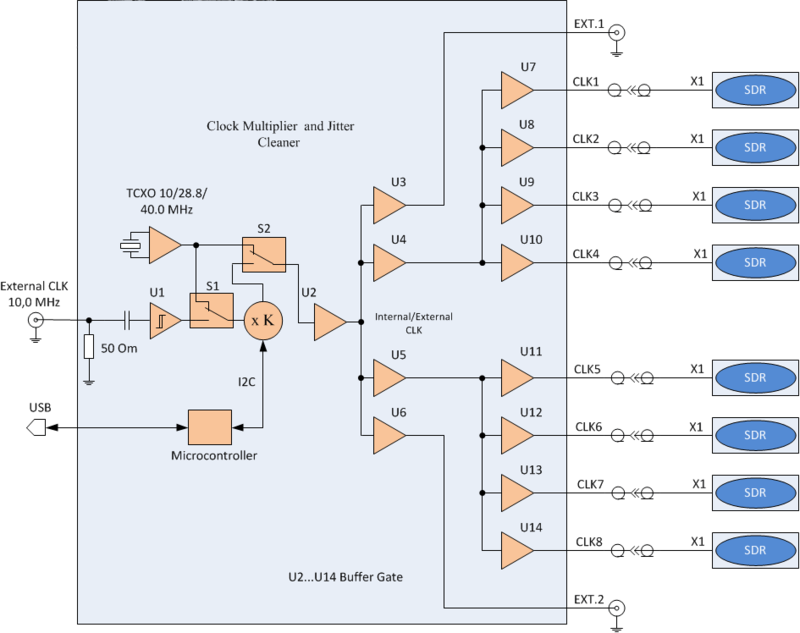 The 5PB11xx (Datasheet) is a high-performance LVCMOS Clock Buffer Family. 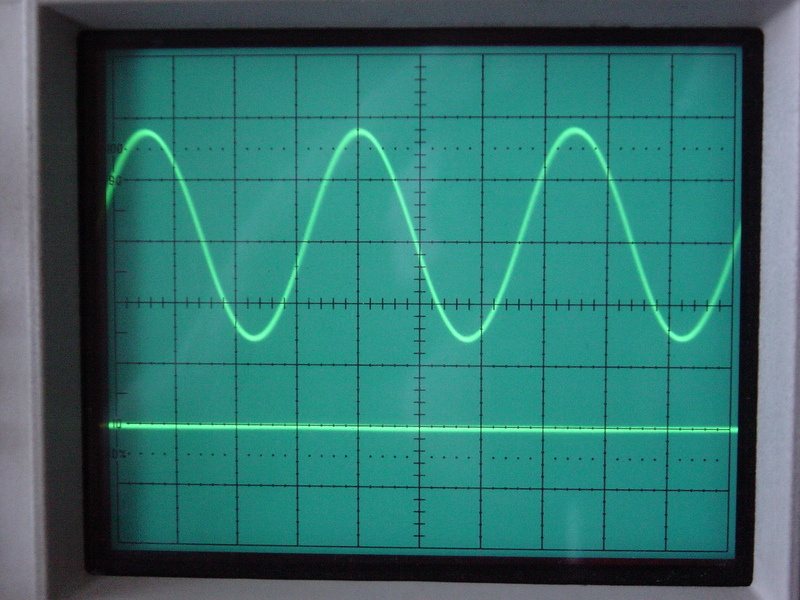 It has best-in-class Additive Phase Jitter of 50fsec RMS. There are five different fan-out variations, 1:2 to 1:10, available. The IDT5PB11xx also supports a synchronous glitch-free Output Enable function to eliminate any potential intermediate incorrect output clock cycles when enabling or disabling outputs. It comes in various packages and can operate from a 1.8V to 3.3V supply. Calibration and management of the directional antenna locations. Tuning to the necessary bearing. Calibration of the coherent receivers using the noise sources which enable calibration and synchronisation of data streams using the gated RF noise. active LOW operation). The system master can enable the I/Os as either inputs or outputs by writing to the I/O configuration bits. The data for each input or output is kept in the corresponding Input or Output register. The usage of the register is described in the support section. I2C-bus repeater provides additional possibilities for the management of the peripheral devices based on the I2C-interface, e.g. low-speed DAC/ADC, step motor, sensor information reading (e.g. temperature, ventilator cooling, system control), etc. In general, the usage of the external clock buffer can lead to additional interference. 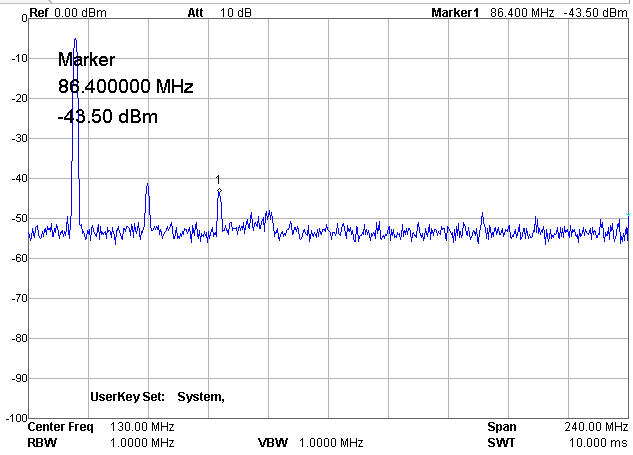 Synchronization signals, which are square pulses at the 28.8 MHz, create a wide range of signals with harmonics, which are multiples of the 28.8 MHz: 2fs, 3fs, 4fs, 5fs, and can be the source of additional interferences. 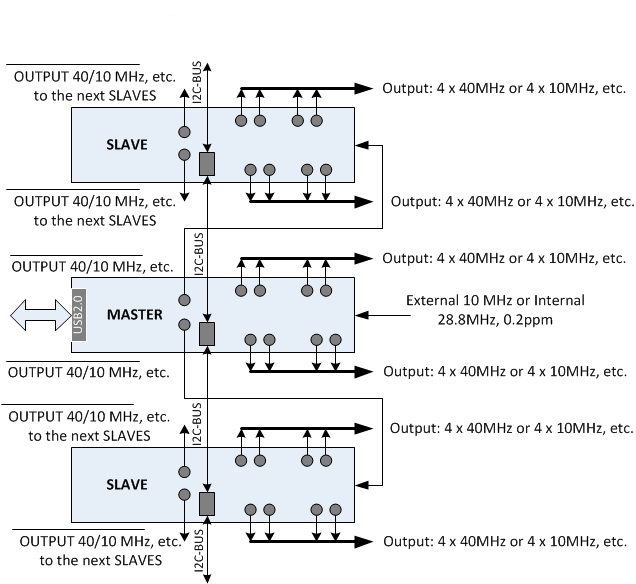 Therefore, it is necessary to utilise a filter with a nominal cutoff frequency at 29 … 30 MHz for the suppression of higher order harmonics (see section Low Pass Filters 30MHz Cards for more information). 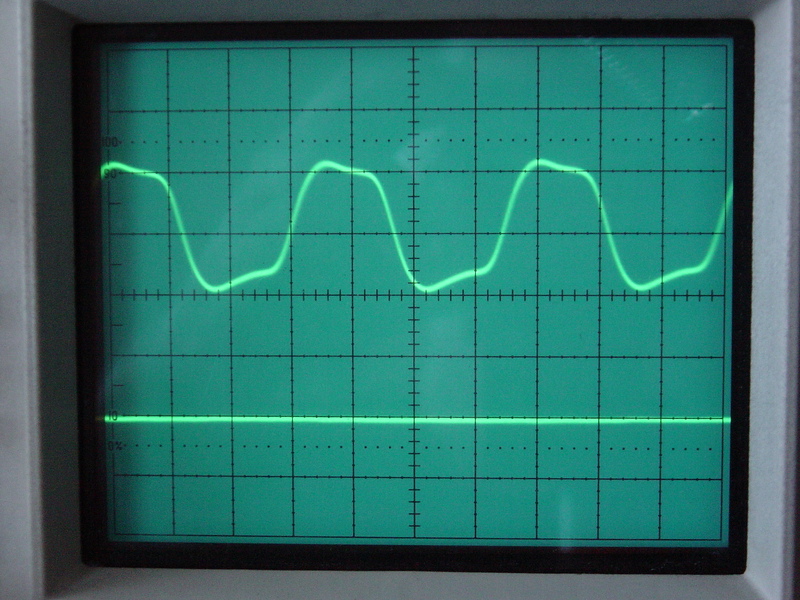 As seen from the table, using LPF with a cut-off frequency of 35 MHz substantially reduces the unwanted harmonics, and hence, reduces the possibility of undesired spurs in the spectrum of the received signal. Ultraminiature Coaxial Connectors are installed on the card in order to distribute the clock frequency on all single receivers using coaxial pigtails. The usage of coaxial pigtails reduces the phase noise and eliminates the interference of the clock frequency, including harmonics, with the received signal. The clock generator and clock expansion cards are not restricted to the 28.8 MHz. Custom builds are possible for other clock frequencies with required precision. The Expansion Card has the same architecture as the Clock Card but does not include TCXO 28.8 MHz and Buffer Gate. Can I get an exact parts list. I want to build this for a project to capture frequency hopping gsm. As I have a very low budget. My only option is to make one myself. we are planning to provide a tutorial how to build the 2 or 3 channel coherent receiver using RTL-SDR v.3 modules without additional components (e.g. clock card). Will it be enough for your project? In case of GSM you can receive the send- and receive-side using only 2 receivers. Moreover, why you actually need the coherence in your scenario? If you have several dongles you can provide some kind of the synchronisation backon in order to get the time synchronisation of IQ-streams then you can decode the channel in parallel and after that joint the channels after that. If you don’t have packet losses, raw data stream from the receiver remains synchron. I need to have a 4 channel reciever for my project. it requires around 7 mhz of bandwidth. I want to use them as a single receiver. for which I am comparing and synchronizing the phase in MATLAB but I need to time synchronize them externally. Also what exact buffergate is being used here ? Can I get the PCB design. Or I’ll have to make one myself? we added a detailed description to the buffer gate section. I’m also interested in whether you have made (or are considering making) the Clock Card design specifications open-source. I’m working with a group to create a direction finding wildlife telemetry receiver network, and we are operating on a very low budget, and would also like to keep as many of the components of our overall design open-source as possible. I don’t think that the open sourcing will reduce the prices. Initially, we developed this project for the commercial customer in order to improve the reception in the moving objects; the second idea was to use it in DRM30. Our public available realisation was made as flexible as possible incl. different components versions for various application scenarios, e.g. clock-card10 or clock-card 0.2/2. You can consider these products as development boards in order to test your ideas or make some research. These were not intended to be and are not the mass-market products. The design and realisation for volume products (with cheaper prices) should be different. We designed such version for the above mentioned application scenario but cannot provide more details at the moment. We provide the detailed description about the public available prodcuts. Moreover, you can ask the technical questions that we will try to answer.